With Halloween only days away, I couldn't resist sharing these brilliant fashion-inspired costumes. Aren't they fantastic?! 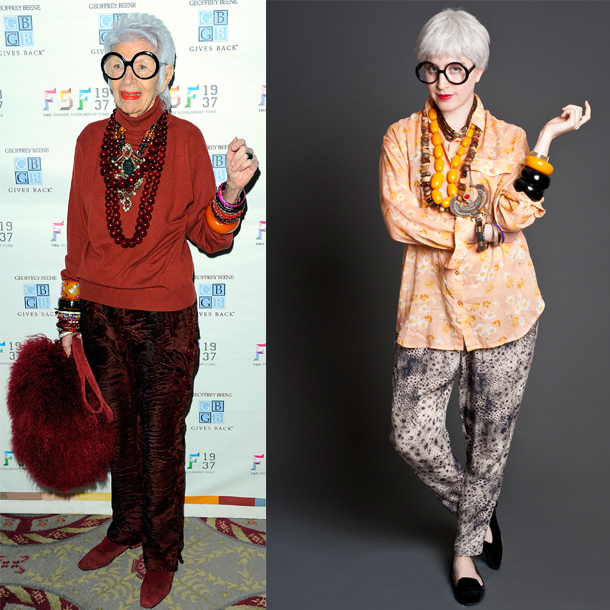 Especially Iris Apfel (who I dream of being when I grow up) and Anna Dello Russo! I remember when I was younger always wanting the sparkliest, girliest costume my mom and I could find - think Minnie Mouse, 1920s flapper, Pink Lady, gypsy, and Princess Jasmine. I've put together a few pieces below to help you channel quite the glamour girl herself, Rachel Zoe - pretty spot-on if I do say so myself! Share your 2012 costumes in the comments! That is a great Rachel Zoe! itll be fun to ADR for a day! That hat is spot on Rachel Zoe! Too cute! Have a great Monday!! I had a good laugh this morning when I saw these! What a great Anna della Russo! So much fun! Thanks for sharing these Julie. I love all of these! HAha... My favorite is Tom Ford! I love your take on Rachel Zoe... But I'm pretty sure I would wear this in my regular life too... Haha! Happy Monday!